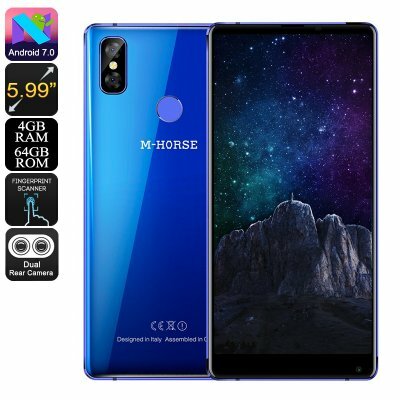 Successfully Added M-Horse Pure 2 Android Phone - Android 7, Octa Core CPU, 4GB RAM, 5.99 Inch Bezel-Less Screen, Dual Rear Camera (Blue) to your Shopping Cart. This is a superb large screen offering with an aluminum frame and durable glass cover that brings the latest phone features at an unbelievable price. A fingerprint scanner on the rear of the phone protects your data from prying eyes and the dual camera and flash offer stellar photography, even in low light. The front of the phone has a 5.99-inch screen that takes up 76% of the space. This bezel-less display boasts 1440x720 resolutions and with the crisp clear images can be seen even from wide angles thanks to IPS. Looking beneath the outer beauty of the M-Horse Pure 2 smartphone you find a potent hardware setup. An MTK Octa Core CPU and 4GB of RAM can run your apps with speed and efficiency even when multitasking. A Malie T860 MP2 GPU looks after your graphics needs and ensures games run smoothly without lag or dropped frames. There are two SIM card slots on this Android phone, each supporting 2G, 3G, and 4G networks. Now you can enjoy better connectivity, manage personal and business contacts with ease and avoid roaming charges when traveling with this smartphone. Alternatively, you can use one of the SIM slots for a micro SD card that lets you complement the 64GB of onboard memory with up to 256GB of additional storage. The 3800mAh built-in battery ensures good operating times and with the phones USB type-C port, it can be recharged quickly when the day is done. The M-Horse Pure 2 smartphone comes with 12 months warranty, brought to you by the leader in electronic devices as well as wholesale Android Phones from China..
Ottimo telefono, veloce, linguaggio italiano corretto. Funziona perfettamente in 4g. Haven't yet received mine, but I'm so excited and can't wait!! After doing much review checks on this phone, it's amazing. The rear cameras are perfect photo and video quality. Way better than some other phones I've had and seen.